Licensed Marriage and Family Therapist in Private Practice for 33 years in Santa Barbara, CA lic.#16751. Carleton University, Ottawa, Ontario, Canada 1969-1970. Masters of Arts Degree in Social and Child Psychology. Reed College, Portland, Oregon 1967-1969. Bachelor of Arts Degree in Behavioral Psychology. Knox College, Galesburg, Illinois 1966-1967. University of Oregon, Eugene, Oregon 1964-1965. Licensed Marriage and Family Therapist #16751 by the State of California, February 1982. Member of CAMFT, California Association Of Marriage and Family Therapists, 1982 to present. #485. Member of SBCAMFT, The Santa Barbara Chapter of the California Association of Marriage and Family Therapists, 1982 ongoing. Member of AWC, Association of Women in Communications, 2012. Leader of workshops in Attitude Reconstruction. Communication and Conflict Resolution. 1991-present. Teacher of Co-operative Co-Counseling to paraprofessionals, Santa Barbara, Ca. 1982-1985. Teacher of Transcendental Meditation in Ottawa, Ontario, Canada; Hartford, Conn.; and Portland Oregon, 1974-1982. Instructor of Introductory Psychology, Carleton University, Ottawa, Ontario, Canada 1969-1975. Certify teachers of Attitude Reconstruction. 1991 to present. Advisor to students enrolled in B.A. and M.A. Programs and interns in the process of becoming licensed Marriage and Family Therapists. 1984 to ongoing. Supervisor of groups of interns in training at the Santa Barbara Night Counseling Center. Santa Barbara, Ca. 1987-1989. Family Service Agency, Santa Barbara, CA, 2012 ongoing. Deliver presentations to school-based counselors. Santa Barbara Women’s Festival, Santa Barbara, CA, 2011 & 2012. Deliver presentations and lead round table discussions. Family Resource Center, Santa Barbara, CA, 2010 ongoing. Consulting to administrative staff. Ventura County CAMFT presentation at monthly luncheon, August 2014, Camarillo, CA. Emotions, Thoughts, and Change. Cottage Hospital Grand Rounds presentation, December 2012, Gracefully dealing with emotions and negative thoughts. Santa Barbara Chapter of California Association of Nurse Practitioners presentation at monthly meeting, May 2012. Santa Barbara CAMFT presentation at monthly luncheon – June 2011. Emotions, Feelings, Thoughts, and Change. Presenter at the Fourth, Fifth, and Sixth Annual Psychotherapists Conference, Siddha Yoga Meditation, So. Fallsburg, New York, Aug. 1996-2001. Steering Committee member for the SYDA Psychotherapists Conferences, So. Fallsburg, New York, 1997-2002. Presenter at the Annual Conference of Association of Humanistic Psychology, Evergreen, Washington, Aug. 1991. 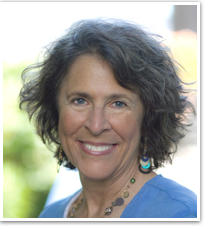 Jude Bijou is a licensed marriage and family therapist (MFT), an educator in Santa Barbara, California and the author of multi-gold awarded, Attitude Reconstruction: A Blueprint for Building a Better Life (Riviera Press, 2011). As the daughter of a famous pioneer in the field of behavioral child psychology and applied behavior analysis, Jude’s upbringing sounds like it would be pretty cool. There was just one problem: she was miserable. Earning a BA in psychology from Reed College and a master’s in psychology from Carleton University, she became a marriage and family therapist. Success was attained, yet something was still missing. Looking eastward, she immersed herself in the world of meditation and Vedic philosophy. The result: an integrated, truly holistic approach to viewing ourselves and our relationships with others. Her award-winning system, Attitude Reconstruction was birthed into the world. In 1982, Jude launched a private psychotherapy practice and started working with individuals, couples, and groups. She also began teaching communication courses through Santa Barbara City College Adult Education. Word spread about the success of Attitude Reconstruction, and it wasn’t long before Jude became a sought-after workshop and seminar leader, teaching her approach to organizations and groups. 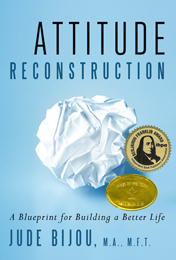 The culmination of Jude’s groundbreaking work can now be found in Attitude Reconstruction: A Blueprint for Building a Better Life. These simple principles have impacted countless clients, seminar participants, and students. And Jude promises this: if we can learn to harness the tools we’re intrinsically born with, creating a life full of joy, love, and peace is truly possible, right here, right now.